I was introduced to tennis age 7 by a coach from my local tennis club in Chichester West Sussex. The coach was running a taster session at my primary school and I enjoyed the experience enough to spend the next week badgering my parents to take me along to a session at the club. My persistence paid off and the next week I went along to a Saturday morning pay and play session. The enthusiasm I had for the game after that first session grew in the following months and before long I was competing in tournaments on a frequent basis. I had many ups and downs throughout my junior competition years, but fortunately I had enough success that it enabled me to play for my home county at every age group, regularly attend both regional and national training camps and play competitive tennis all over the UK. As a senior I have continued to represent Sussex whenever possible, and have been a frequent competitor on the British Tour circuit. Despite the fact I am no longer competing on a regular basis, I do still enjoy playing the game when I can and also aspire to engage in multiple sports competitively for as long as I am able to do so. During my college years I had the opportunity to be a part of the LTA AASE scheme at Brighton Health and Rackets Club, which I completed in 2011. During this time I accomplished both my LTA level 1 & 2 coaching qualifications and begun assisting with sessions on weekends and school holidays. This peaked my interest in more coaching, so following this period I immediately went on to complete my LTA Level 3 in 2012. I then decided to start coaching full time at the same club in Chichester where I had first picked up a racket. This gave me an excellent platform to gain experience as a coach. I was able to assist many different players from toddlers at the start of their journey, to competitive teenage athletes, to veterans of the game at 65+. Every one of them helped me learn and develop as a coach and person. 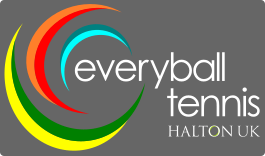 Completing my Level 4 SCC in 2016 and joining the Everyball team at Halton in 2017, has been a big step forwards and I am excited for the new challenges and experiences that lay ahead. I especially look forward to playing my part in helping Halton continue to play a leading role in British tennis. I am grateful to have the opportunity to help people get closer to achieving their goals in tennis everyday and I aim to continually improve my capabilities as a coach and character as a person, so that those goals are more likely to be achieved for both myself and my players.